Philips has finally offered up a UK release date for its Philips Cinema 21:9 Platinum TV range. The 3D version of Philips' rather good 21:9 series features Bright Pro, 400Hz Clear LCD technology, Perfect Pixel HD processing and Ambilight Spectra 3 - all of which combine to create an awesome cinema-like picture quality. Alongside these features there's a number of impressive specs, including: a contrast ratio of 10,000,000:1, 2000 LEDs inside and a decent screen size of 58 inches. Philips' Clear LCD technology is key to the 21:9 as it reduces cross-talk. Given that the 21:9 Platinum is a 3D TV this is a vital feature to have, as problems with cross-talk is one of the main bugbears of the technology. 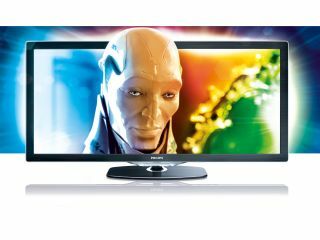 The Philips 21:9 Platinum uses active shutter 3D and the TV itself comes complete with a built-in 3D transmitter. There is also internet capabilities on the 21:9, which hooks you up to Philips Net TV. Alongside this is a built-in web browser. The Cinema 21:9 Platinum edition (58PFL9955) comes complete with a built-in 3D transmitter. Annoyingly 3D glasses aren't bundled so you will have to get them through the optional PTA03 pack. The Cinema 21:9 Platinum edition has a November UK release date and will cost £3,999.